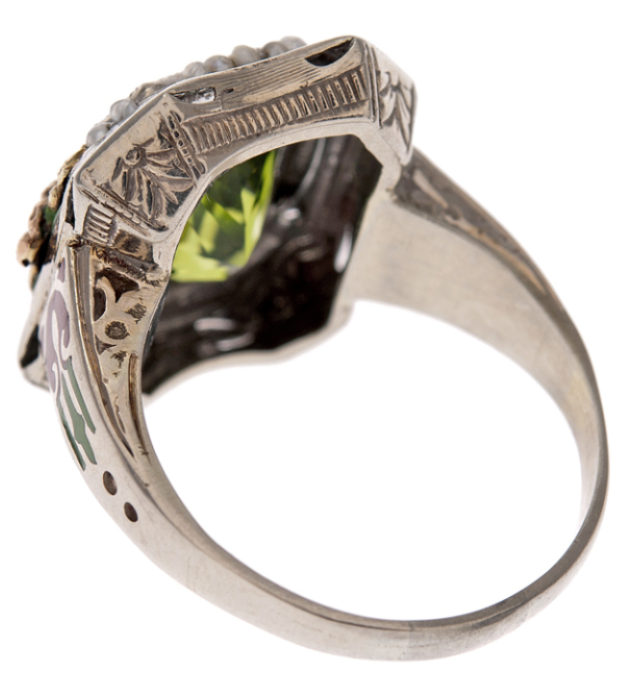 Antique peridot, enamel, and pearl ring. This spectacular thing was made in 1900. It centers an intense, dazzling peridot surrounded by a crown of tiny rose gold flowers and natural seed pearls. As the icing on the cake, the border is surrounded by an additional layer of rusty brown and grassy green enamel. Notice how the pearls are beads strung on a wire, rather than set into the piece like the peridot. Cool, yes? As is befitting the opulence of the front of this ring, the back, shank, and gallery are all covered in delicate engraving. It’s lovely from every angle. This ring is currently for sale at Fourtane, listing available via 1stdibs. All images and info are thanks to Fourtane and 1stdibs. Gorgeous peridot and diamond ring. I think this peridot and diamond ring looks edible. Look at the color of that peridot. Don’t you want to lick it? The 18 karat yellow gold and diamond setting provides a lovely contrast to the lively faceted peridot. This ring would still be pretty if the setting was silver, but I think the gold is perfect for the color of the center stone of this peridot and diamond ring. Peridot isn’t really a stone I think about much, but this one is Jolly Rancher-ishly fantastic. This ring is estate but not antique, although I think the Edwardian influence is evident. This beautiful peridot and diamond ring was sold by Lang Antiques – you can see it in their archive. Thanks to Lang for the images and info.